On the big Scottish salmon rivers like the Tay don't waste your day trying to force a salmon you've seen to take your fly as normally if a take is going to occur it will happen fairly quickly and soon after a salmon sees your fly for the first time. Effective water coverage plays a big part of success in this wonderful pursuit and good spacings between each swing of your fly will get you closer to a fish that is willing to cooperate. If you sit over salmon that are clearly not going to be caught like many salmon fishers do you're only training salmon to accept your fly's presence instead of searching effectively for the one that is in the right frame of mind to have a go! On a personal basis I'll move a minimum of 3 feet between every cast and I'll put this riverbank movement in as either the fly hits the water if I'm throwing a mend or as I'm hand lining in prior to recasting if a mend is not required. 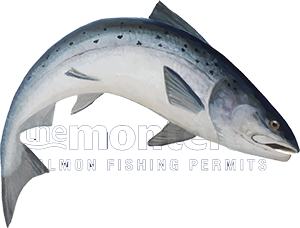 If you think about water coverage properly and how it obviously will increase your chances of placing your fly in front of a taking fish over the full course of the fishing day then you'll appreciate the sense in understanding this important salmon fishing factor. Being a 'heron' on the riverbank will very rarely work and it will also diminish the salmon fishing day for other paying guests on the beat. Increase your chance of catching a salmon and stay on the move throughout your fishing day is my advice and engage logic in that the more water you cover properly the better the chance of hooking a fish. In most cases a salmon will take your fly when your mind is dwelling on a far distant subject from the 'task in hand'. With that in mind I've always wondered if salmon can sense eagerness from anglers and it wouldn't surprise me if they could as any creature that can scent it's way home from its Greenland feeding grounds is certainly far more astute than we often give them credit for. Enjoy your casting and riverbank movement and become a water coverage machine. If you do then sooner or later you will no doubt be rewarded by our Salmon God. Salmon that have seen too much of a fly or lure will more than likely have switched their predatory inquisitiveness button to 'off' mode. A properly spaced fly or lure will stand a better chance of the desired reaction as a salmon won't get time to think if all of a sudden the fly is right in its strike zone. I would say from my experiences in this game that many more times than not less is definitely more in forcing a stubborn salmon to take. Again all of these pointers comes down to sub surface thinking and not switching your mind off as your fly lands after recasting like so many salmon anglers currently do. Become your fly or lure and give serious thought to how salmon may be seeing things.